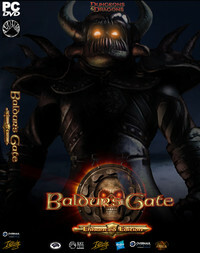 The new, enhanced edition of RPG classic Baldur's Gate, cleverly titled Baldur's Gate: Enhanced Edition, is now available on iPad. The download clocks in at a hefty 1.7gb and requires any version of the iPad running iOS 6. If you fancy picking it up it'll set you back $9.99, £6.99, €8.99 or your local equivilent. The game is already out on PC, while Mac and Android versions will also follow at a later date in the near future. This particular version of the game is 'enhanced' in several notable ways. The game has been remastered across the board, but also ships with additional quest lines, dungeons and characters. As one of the all-time classic RPGs, it's a welcome addition to the ever-growing line-up of great mobile RPGs.